We generate an unbelievable amount of data every day—2.5 quintillion bytes. According to Forbes, 90% of all data has been created in the last two years, and by the year 2020, one-third of all data will pass through the cloud. All data that you are responsible for needs to be backed up, safely and securely. Without proper backups, you are in danger of a costly security breach or loss of data through corruption or a natural disaster. 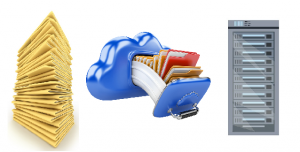 Physical storage works best for companies that mostly deals with paper files and records. This type of storage is located in a different place and is climate-controlled and watched by security cameras. Cloud-based storage will work best if your data is digital. It is cost-effective since you pay for the amount of digital space you are using. And when you use encryption and two-factor authentication, it is an extremely safe way to store your data. If your past data is already backed up in this format, it makes sense to keep this system as it is cost-effective to do so. Find a storage facility that offers vaulting storage and rotation services so you can easily stay up-to-date with your backups. If your backups are stored in the same location as your current data, you risk losing it all in any variety of disaster; corruption, theft/hacking, computer virus, flood, fire, tornado, earthquake. You should base your decisions about how often to back up your data on how much data is acceptable to lose. It would be tragic to lose nearly a year’s worth of data because you only backed up once a year. Every business uses its data differently; therefore, you should research your options. If you often need to access backed up data, it would be best to have it in digital form. However, if you have files waiting for expiration, they could be simply stored physically at an offsite location. Contact our experts for help deciding your best solution. Record Nations works with experts who can help you maintain your records storage needs, regardless of format. Let us help you find the right document storage solution for your business. To get free, no-obligation quotes from a records management company in your area, fill out the form on the right of this page or give us a call at (866) 385-3706.